Dental implants, or artificial tooth replacements, are used to offset tooth loss. While the dental implant procedure is typically categorized as a form of prosthetic (artificial replacement) dentistry, it is often associated with the cosmetic dentistry category as well. There are a number of restorative options for the treatment of missing teeth, though none have proven as effective, in terms of functionality and durability, as implants. In some cases, dental implants are the only logical choice for teeth restoration and supporting structures. Because implants are strong, durable, and natural looking in appearance, they are among the most successful dental procedures performed. In addition to feeling self-conscious about smiling or talking, people experiencing tooth loss may also have biting irregularities that have a negative effect on eating habits and can lead to secondary health problems like malnutrition. Fortunately, the problems related to tooth loss can be remedied with dental implants, a fairly simple solution with proven results. Stronger and more durable than their restorative counterparts (bridges and dentures), dental implants offer a permanent solution to tooth loss. Implants may also be used in conjunction with other restorative procedures for additional functionality and effectiveness. A single implant, for example, can serve to support a crown replacing a single missing tooth. 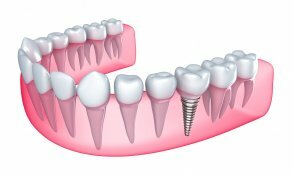 Dental implants can also be used to support a bridge that's replacing multiple missing teeth, or it may be used with dentures to increase stability and reduce irritation of gum tissue.